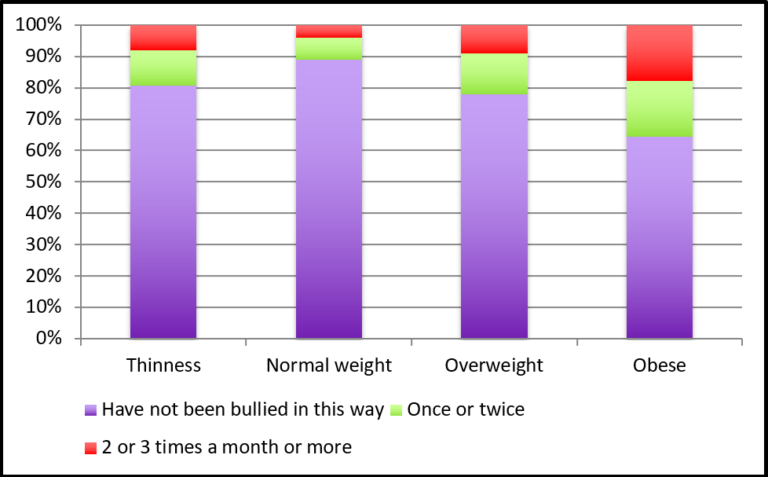 in 2014, 11% of Canadian children and youth in Grades 6 through 10 reported that they had been bullied about their body weight or shape in the last two months. Seven percent had been bulled once or twice, 2% had been bullied 2 or 3 times a month and 2% had been bullied once a week to several times a week. Nineteen percent of children and youth who were thin had been bullied about their body shape or size as had 22% of those who were overweight and 36% of those who were obese. 2Eisenberg, M. E., Neumark-Sztainer, D., & Story, M. (2003). Associations of weight-based teasing and emotional well-being among adolescents. Archives of Pediatric & Adolescent Medicine, 157(8), 733-738. 3Neumark-Sztainer, D., Wall, M., Guo, J., Story, M., Haines, J., & Eisenberg, M. (2006). Obesity, disordered eating, and eating disorders in a longitudinal study of adolescents: how do dieters fare 5 years later? [Comparative Study Research Support, U.S. Gov’t, P.H.S.]. Journal of the American Dietetic Association, 106(4), 559-568.